Two of the hottest up in coming bands ending at the tip of this 2009… Sing a long with ’em… coz we all will. 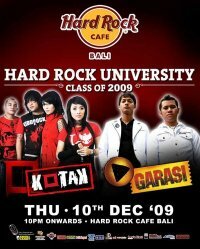 Do not miss it only at the Hard Rock Cafe Bali, Jl. Kuta Beach. Come or you regret it!